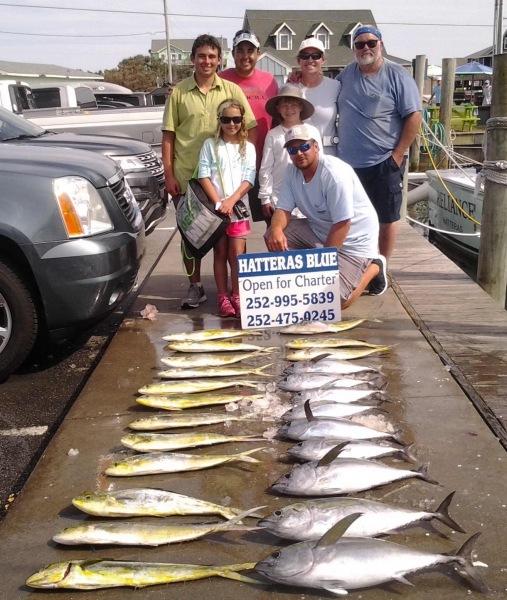 The Hatteras Grand Slam tournament began today. 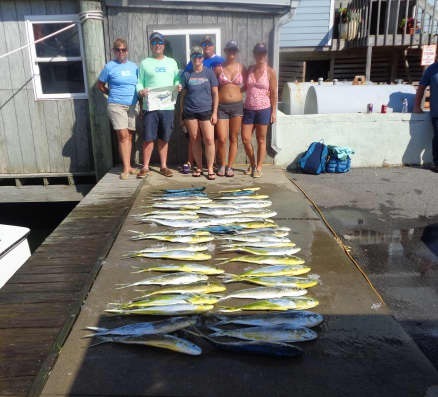 Participants had a beautiful day to head out to the Gulf Stream. You can check out today's results on their website. 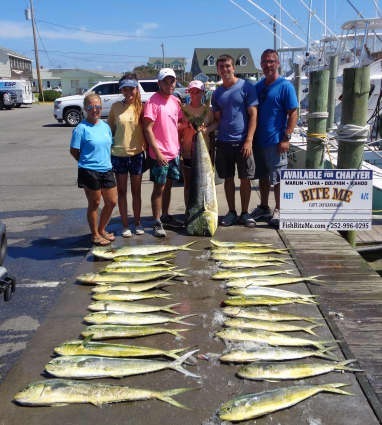 Two Blue Marlin and four Sailfish were released by the Hatteras Harbor fleet! Check out the citations listed. 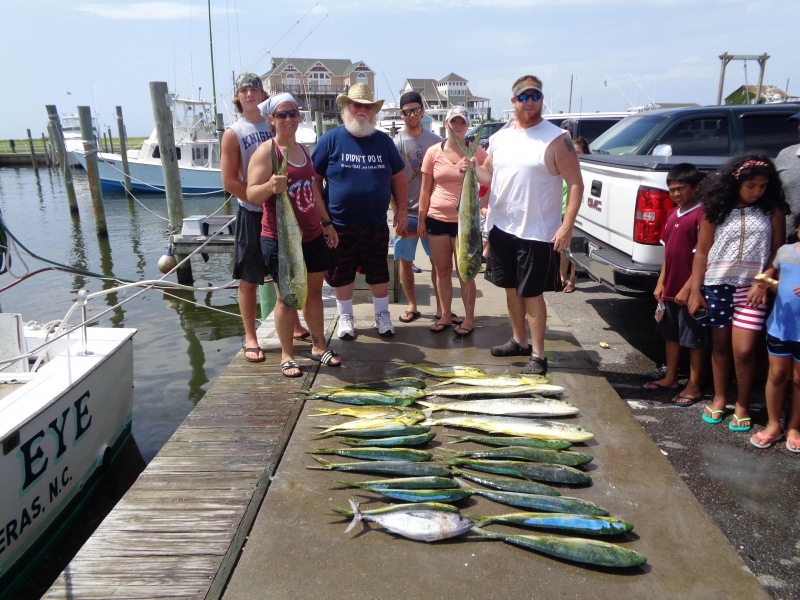 Dolphin fishing continues to be good with several limits coming back to the dock. 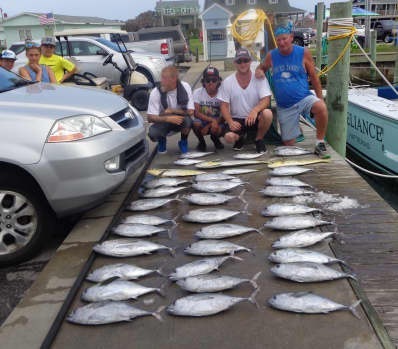 The Blackfin Tuna was not as good as yesterday but some were caught. 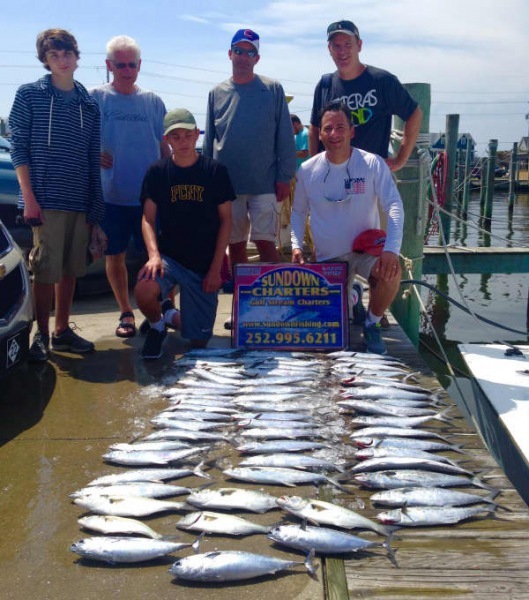 Inshore anglers stayed busy with Spanish Mackerel and Bluefish. Several citation Red Drum were released this morning. Mike Gibson of White Pine, TN: Sailfish release on Big Eye. Jeff Miltenberger of Ijamsville, MD: 48" Red Drum release on Adventure. Gordan Miltenberger of Mt. 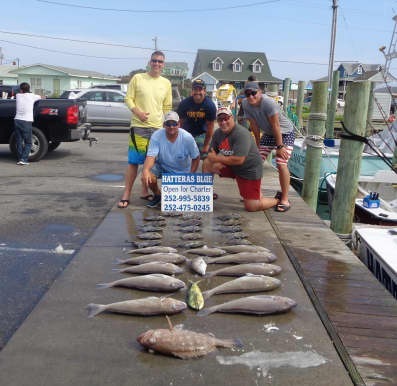 Airy, MD: 45" and 50" Red Drum release on Adventure. 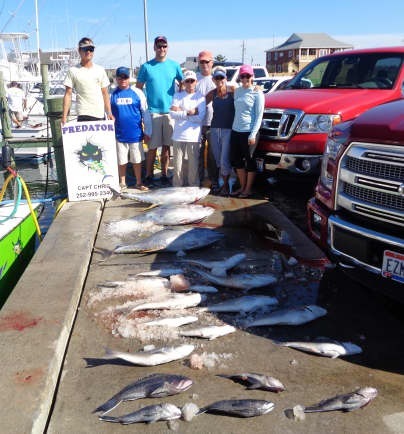 Robert Moore of Quinton, VA: Sailfish release on Predator. Troy Barnes of Sandston, VA: Sailfish release on Predator. 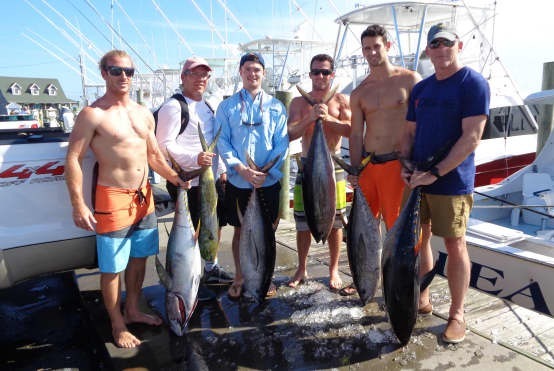 Robert Garrison of Fredericksburg, VA: Sailfish release on Tuna Duck. 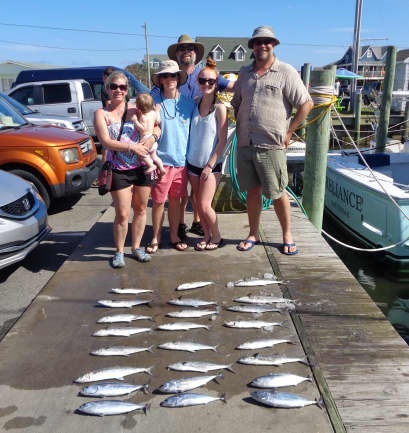 Joy Lingenfelter of Reynoldsville, PA: Blue Marlin release on Tuna Duck. Shawn Hughes of Yorktown, VA: Blue Marlin release on Sea Creature. Here's to the pursuit of happiness on Hatteras Island! Our inshore boats stayed busy with citation size Red Drum as well as puppy Drum this morning. Spanish Mackerel fishing was good this morning but slowed down this afternoon. The Bluefish bite was good this morning! This afternoon one group of anglers went bow fishing and had a great time shooting Stingrays with a bow and arrow! It was a slick calm day offshore except for a few rain squalls. 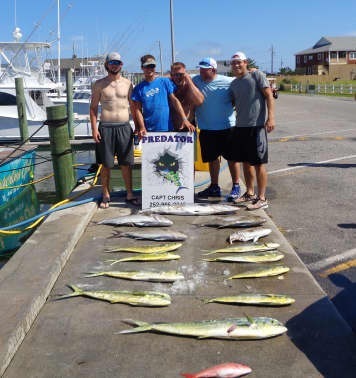 One Blue Marlin was released by Tuna Duck and Native Son released a Sailfish. 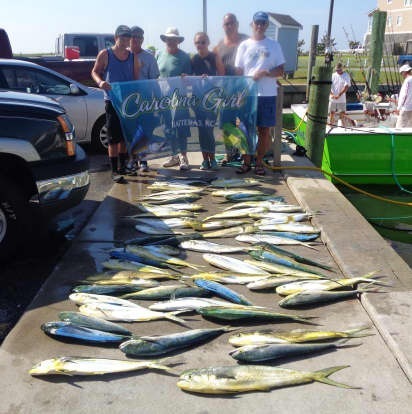 Several Sailfish were released by other boats from different marinas in the area. 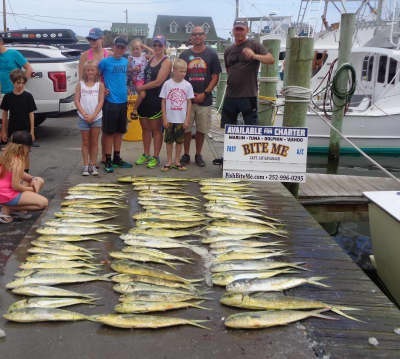 Dolphin fishing was good with both bailers and gaffers reported. The Blackfin Tuna bite was excellent today. 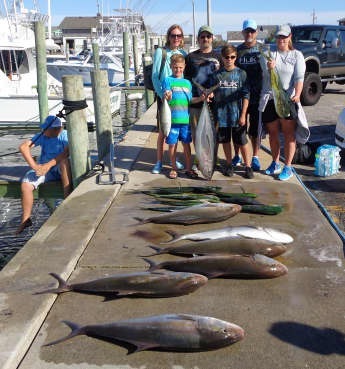 A few Amberjack were boated as well. 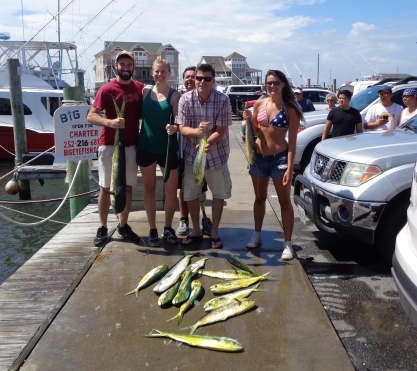 Fishing is a great way to spend time with family and friends call us at 800-676-4939 to book your trip! We'll hook you up. Kevin Oakes of Virginia Beach, VA: 2 48" Red Drum releases on Tightline. 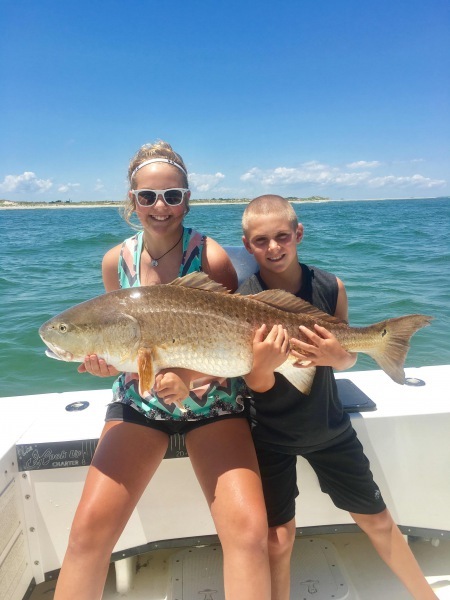 Peyton Buchanan of Cary, NC: 46" Red Drum release on Tradition. 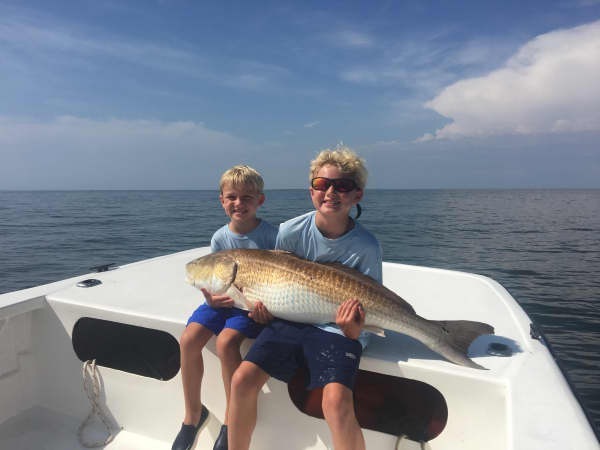 Pierson Buchanan of Cary, NC: 46" Red Drum release on Tradition. John Burns of Bernville, PA: 51lb. 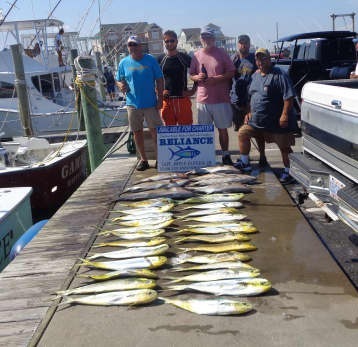 Amberjack on Reliance. Terence Raye of Edison, NJ: 10 lb. Gray Tilefish on Good Times. Melissa Hughes of Richmond, VA: Blue Marlin release on Tuna Duck. 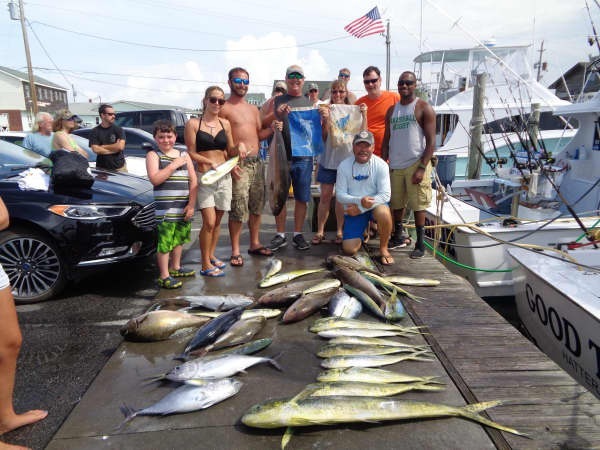 Jamie Barnhart of Leesburg, VA: Sailfish release on Native Son. Weather was a bit windy but all of our charters went out today leaving an empty dock behind. 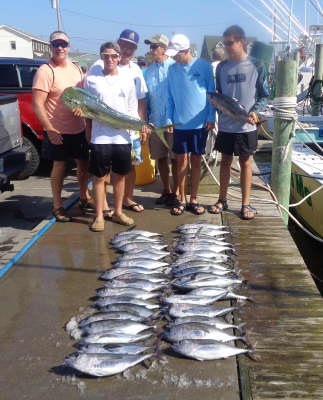 Billfish were certainly making a showing for the 4th! Brother's Pride with our favorite Captain at the helm (Owner Albert Bonney) released a Blue Marlin. Big Eye and Carolina Girl released White Marlin. Bite Me, Hatteras Blue and Hatteras Fever released Sailfish. Good Times released a White Marlin and a Sailfish. 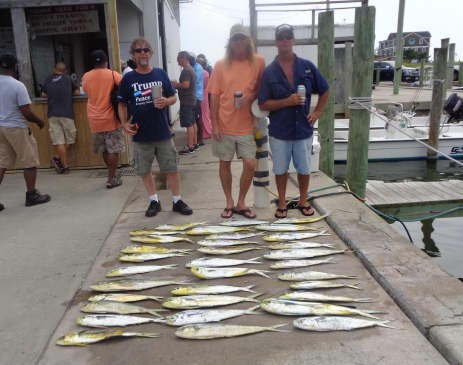 We also had good Dolphin fishing with scattered Blackfin Tuna. Inshore fishing dodged some morning storms but returned with Red Drum and good Speckled Trout. Carolina Girl: Steven Harnois of Virginia Beach, VA released a White Marlin. Good Times: Janice Wyatt of Philippi, WV released a Sailfish. Timothy Wyatt of Philippi, WV released a White Marlin. Hatteras Blue: Katharine Cummings of Indianapolis, IN released a Sailfish. 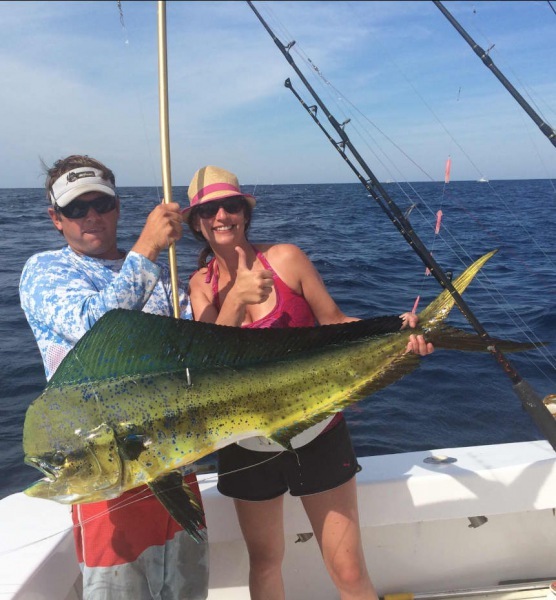 Bite Me: Shari Willis of Germantown, MD released a Sailfish. Only one boat ventured Offshore today they said it turned into a nicer day. 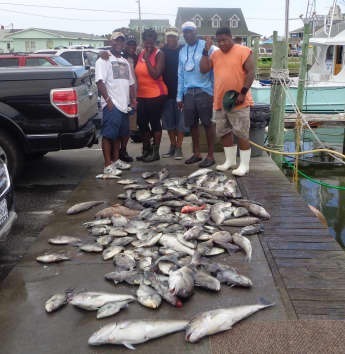 They were rewarded for braving the seas with a good catch of Dolphin, Blackfin Tuna, Amberjack and good Triggerfish. Inshore boats had several out but fishing was a bit slower with Red Drum, Speckled Trout, Sheepshead and Clams. 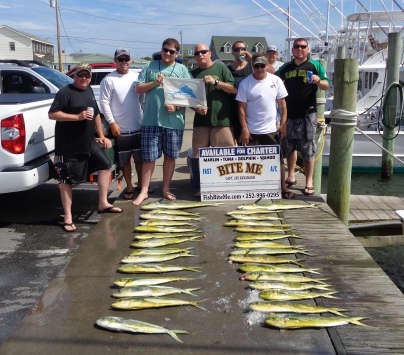 Inshore boats are filling up fast for the week, don't wait to call! High winds kept the Offshore fleet at the dock today. 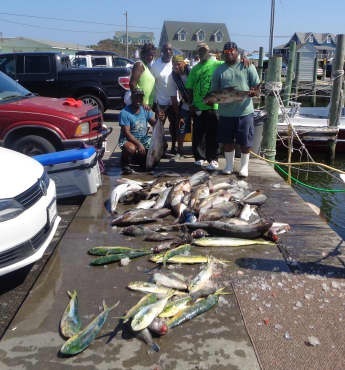 It didn't stop several of the Inshore boats from fishing however. 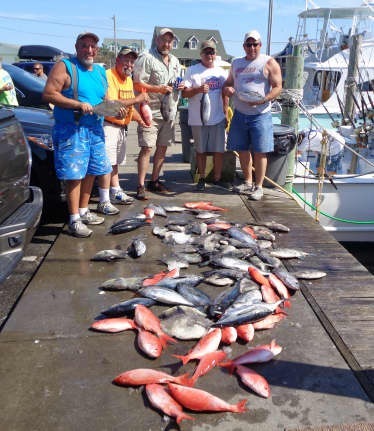 They reported excellent Red Drum fishing. 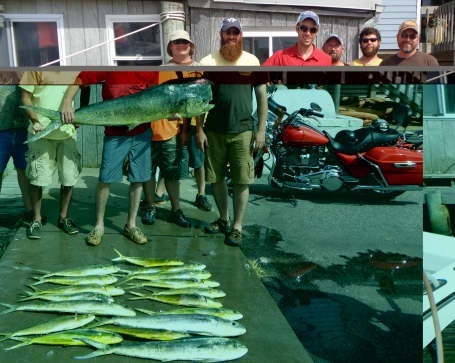 The phone has been ringing off the hook today with people booking their summer fishing trip! We hate to tell people we are all booked up and can't get them fishing so don't miss out. It's hard to believe that it is July already and summer is in full swing! 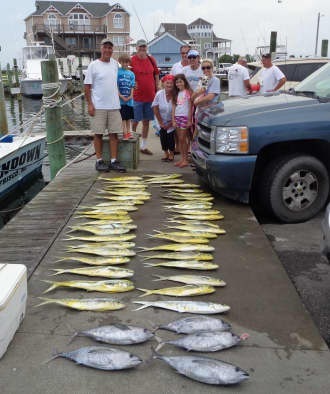 We had a lot of people fishing inshore and offshore today. 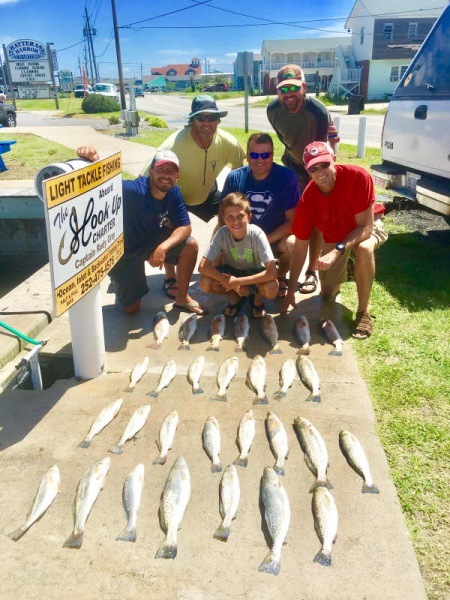 This morning inshore anglers reported great Speckled Trout and real good Drum fishing. The Drum bite was off the hook this afternoon. Offshore, one citation shark was released. 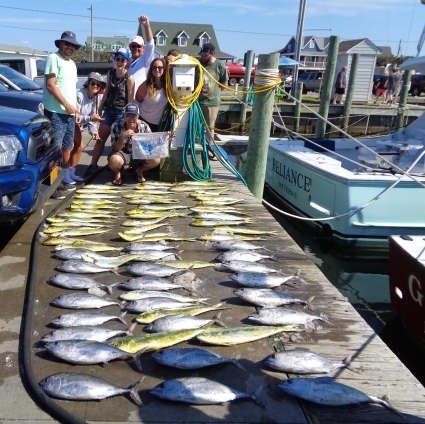 Dolphin fishing was fair and some Blackfin Tuna made it to the fish box. Two Sailfish were released. 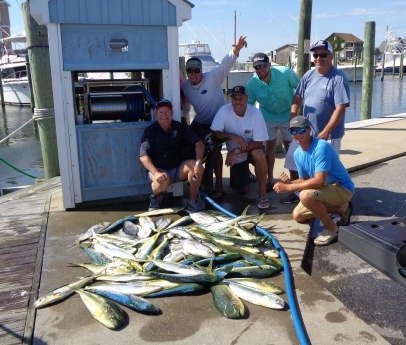 Don't miss out - give us a call at 800-676-4939 and book a fishing adventure today! Robert Anthony Eppler of Clarksville, IN: 95" Shark release on Good Times. 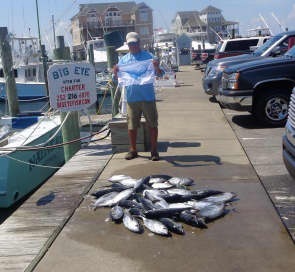 Robert Rogers of Chesapeake, VA: Sailfish release on Bite Me. Chris Hill of Walnut cove, NC: Sailfish release on Carolina Girl. John Hish of Battleboro, NC: 40" Red Drum release on Tradition. 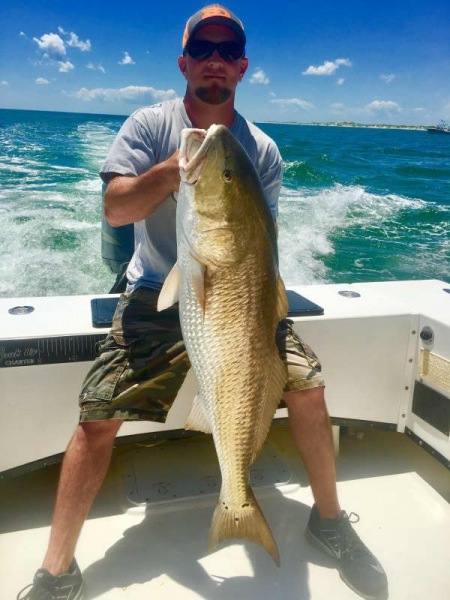 Chad Nelms of Nashville, NC: 47" Red Drum release on Tradition. Basil Garrett of Wilmington, NC: 42" and 45" Red Drum releases on Tradition. David Honeycutt of Williamston, NC: 46" Red Drum release on Tradition. Whitman Casper of Rocky Mount, NC: 44" Red Drum release on Tradition. Kyle Moofils of Amhearst, VA: 42lb. Dolphin on Sea Creature. 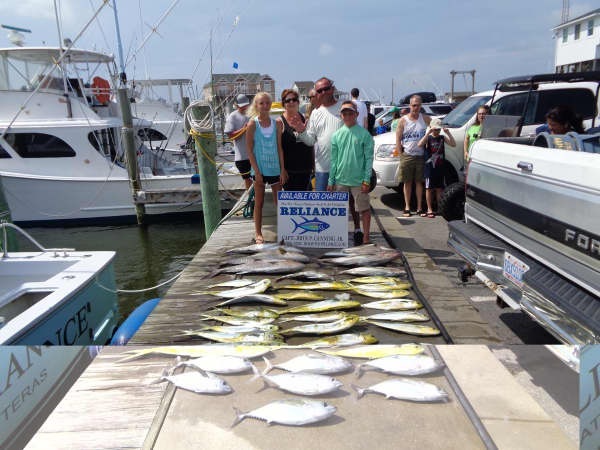 Our fleet stayed busy all day accommodating inshore, near shore, and offshore parties. Our inshore fleet caught Speckled Trout, Flounder, Croaker, and citation Red Drum this morning. This afternoon brought good catches of keeper Red Drum. 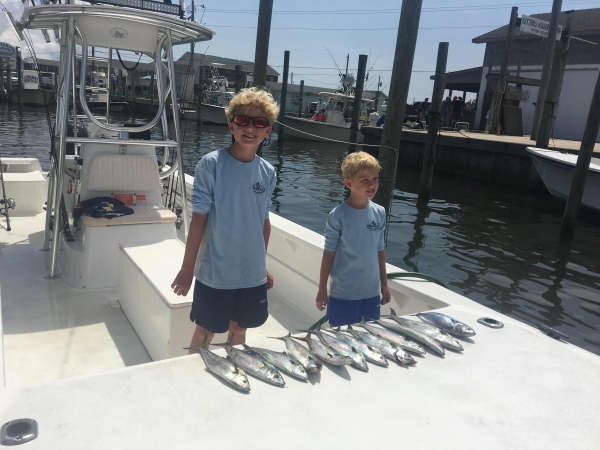 A couple of boats fished near shore and caught Spanish Mackerel and Bluefish. 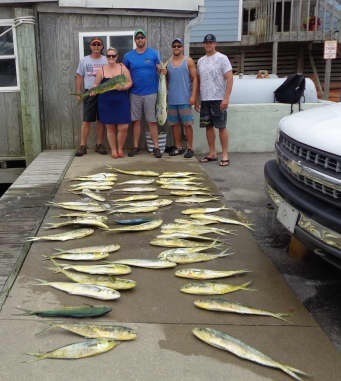 Some of our offshore fleet returned with limits or near limits of Dolphin. 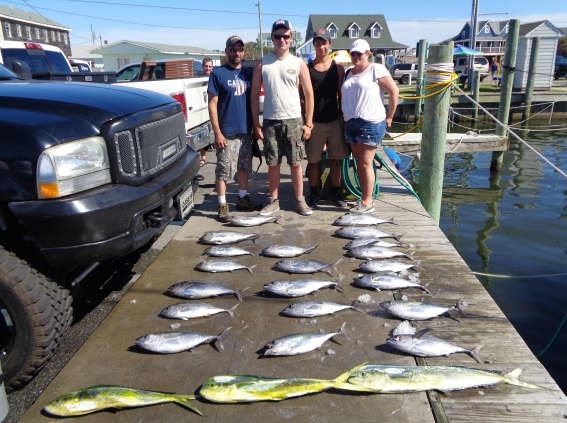 Yellowfin Tuna fishing was good to the north. Good Times release a Sailfish today. Steve McDonald of Hertford, NC: 2 48" Red Drum releases on Sound Bound. Elizabeth Buker of Virginia Beach, VA: 78" Sailfish release on Good Times. 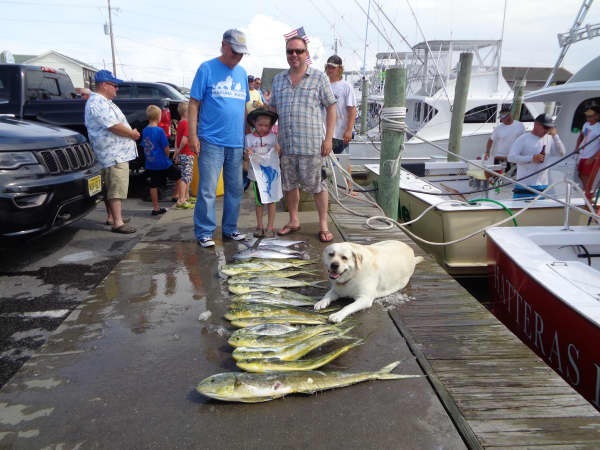 Baily Danaher of Gloucester, VA: 45 lb. Dolphin on Bite Me. 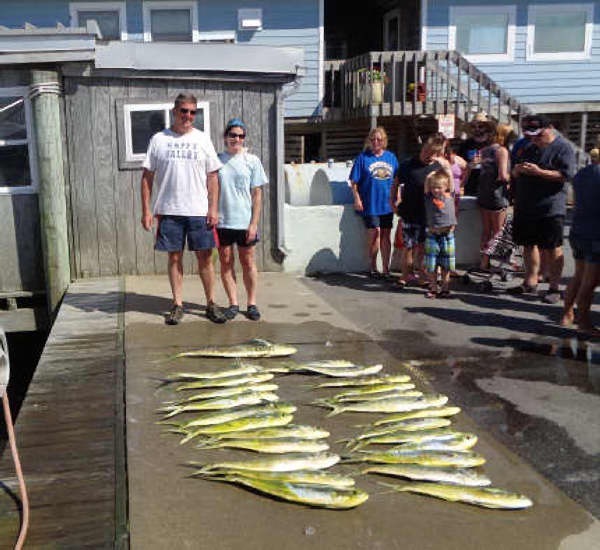 Another beautiful summer day of fishing out of Hatteras! 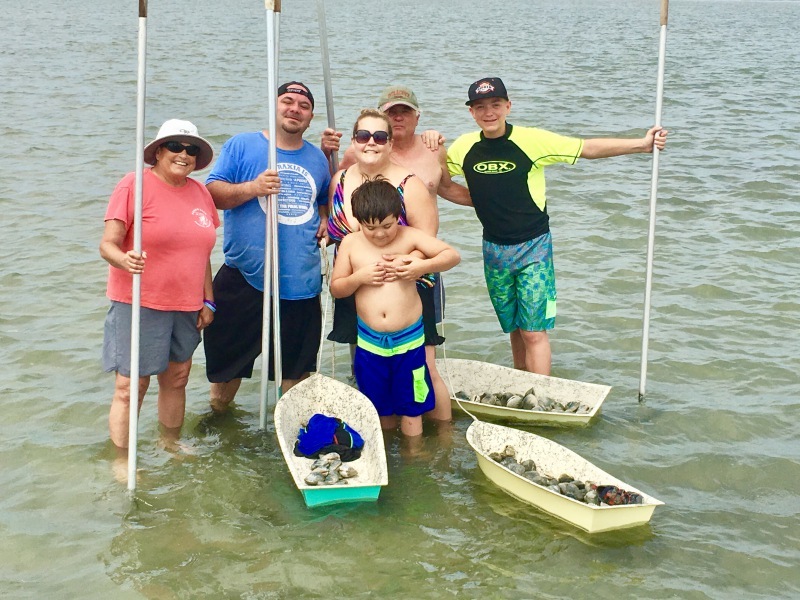 This morning inshore anglers had a great time catching Speckled Trout and this afternoon brought more Specks and good Puppy Drum fishing! 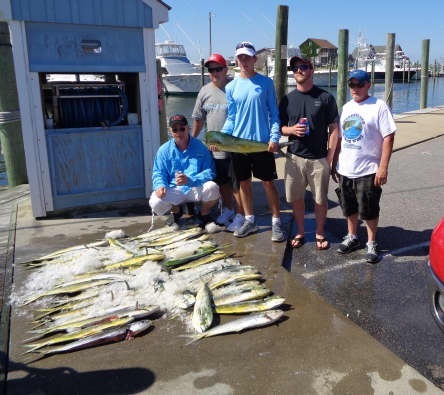 Our inshore fleet offers half day excursions in the Pamlico Sound and is a great way to spend part of the day with family and/or friends. Two Sailfish were released by our offshore fleet today! 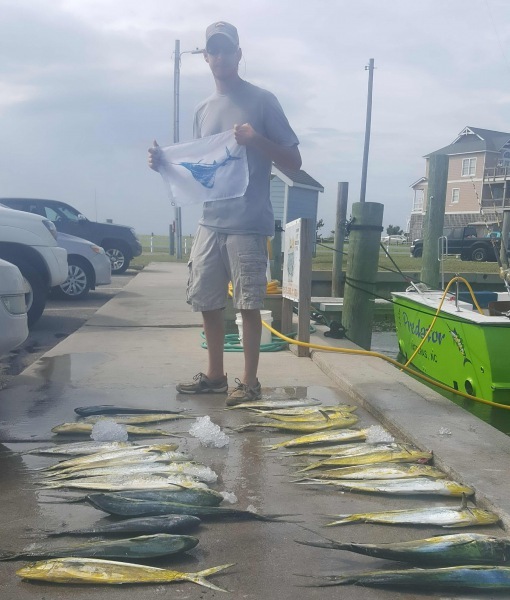 The Blackfin Tuna bite was excellent and a few Dolphin made a showing. 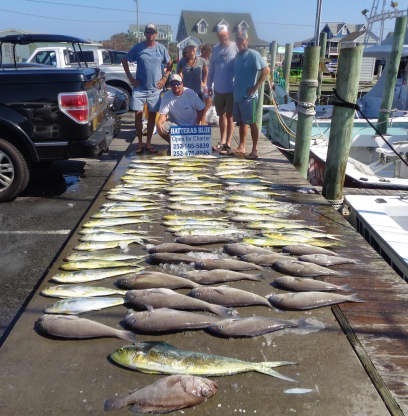 Bottom fish included Triggerfish and Vermillion Snapper. 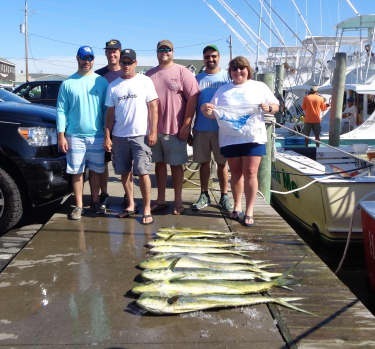 Offshore trips are a full day of fishing in the Gulf Stream. 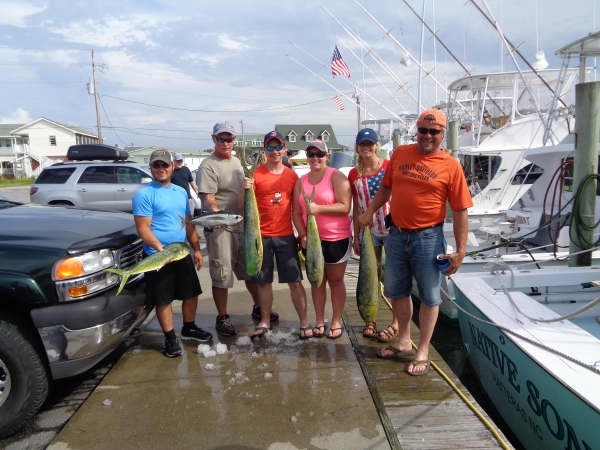 We have near shore adventures available for a half day of fishing along the beach. Give us a call at 800-676-4939 and we'll hook you up! 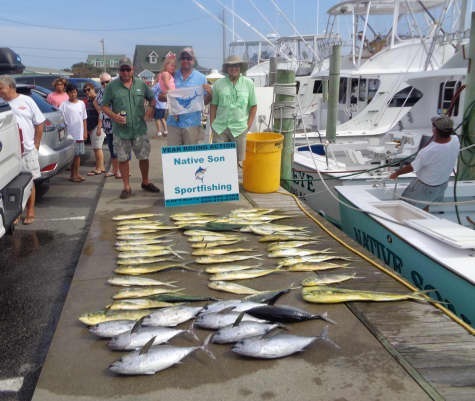 Jeff Pacelli of Charlottesville, VA: Sailfish release on Gambler. 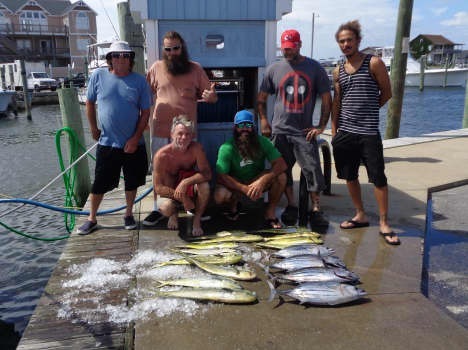 Rick Pelugo of Virginia Beach, VA: % lb. Triggerfish on Good Times. 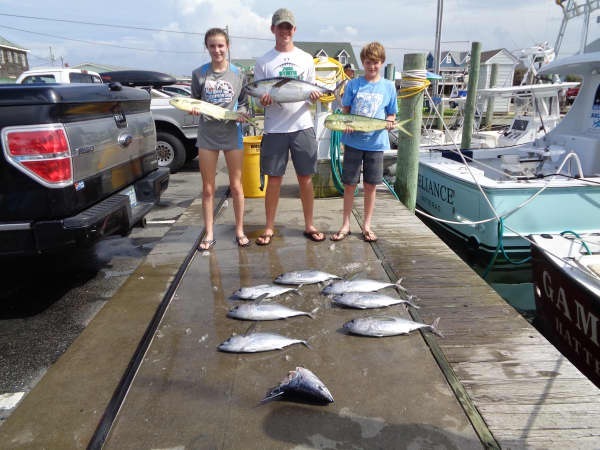 Madeline Hall of Bristol, TN: Sailfish release on Hatteras Fever II. James Bonnell of Oakland, ME: 35" Cobia release on Adventure. The weather this week has been absolutely beautiful. Lots of anglers have been enjoying the conditions along with good fishing. 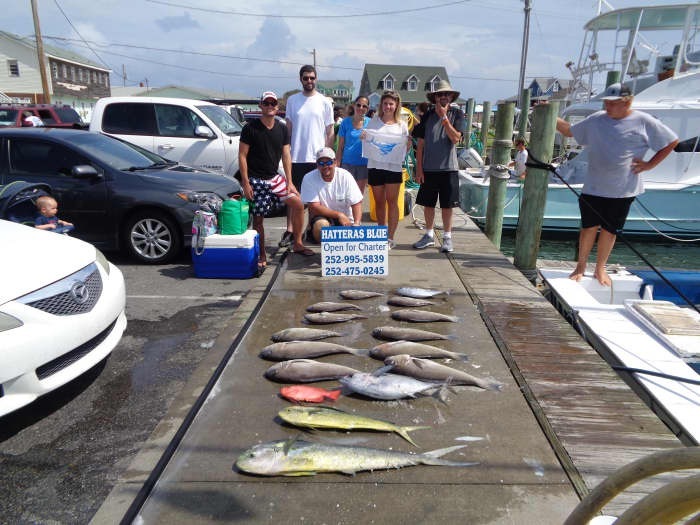 Inshore anglers had an excellent day with Red Drum - releases and keepers!. 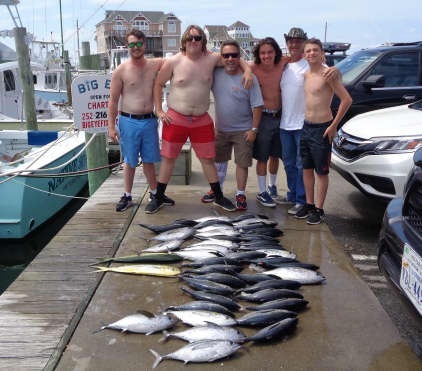 The Bluefish bite was on for inshore and near shore anglers. 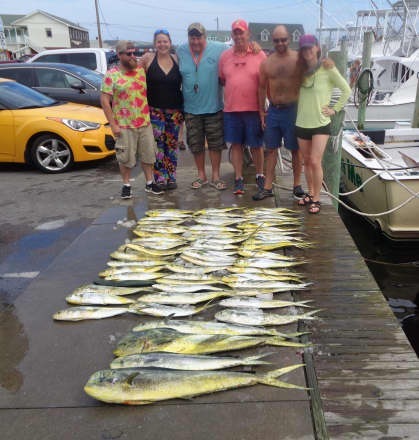 Offshore, two Blue Marlin and three Sailfish were released and put smiles on several faces - Congratulations! Dolphin fishing was good today. The Blackfin Tuna bite was on as well. 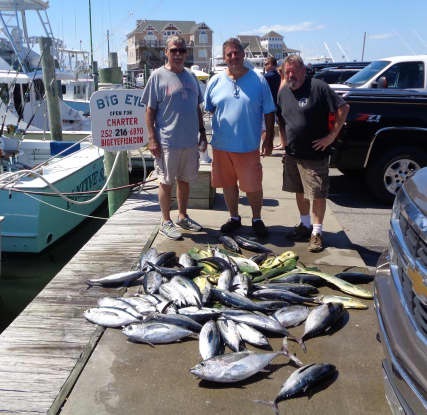 Several nice Yellowfin Tuna were caught to the north. Lots of good eating tonight! 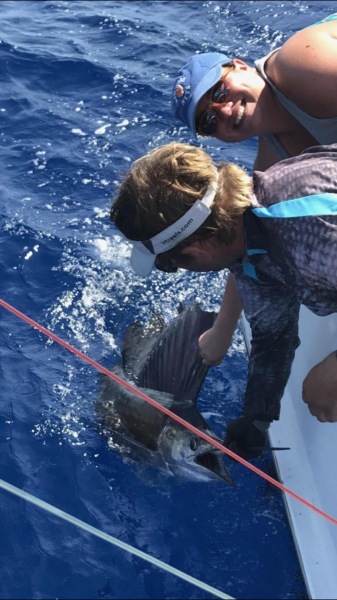 Ayden Throne of Frisco, NC: Sailfish release on Bite Me. Doug Sheeley of Maxwell, IA; 48" Red Drum release on Sound Bound. Eric Handley of Kansas City, MO: 45" Red Drum release on Sound Bound. Teddy Revere of Richmond, VA: 45" Red Drum release on Adventure. James Lipinski IV of Cuyahogu Falls, OH: 45" Red Drum release on Tightline. James lipinski III of Cuyahogu Falls, OH: 48" Red Drum release on Tightline. Mason Brent of Richmond, VA: 45" and 48" Red Drum releases on Adventure. 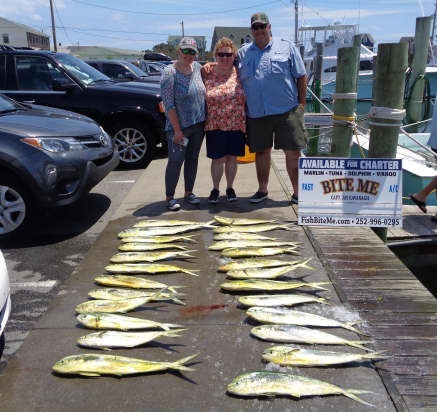 Marian DelDonna of virginia Beach, VA: Sailfish release on Hatteras Fever II. JohnMichael Maurer of Pinnacle, NC: 41" Red Drum release on Hook Up. Madison Maurer of Pinnacle, NC: 42", 44" 46" and 47" Red Drum releases on Hook Up. 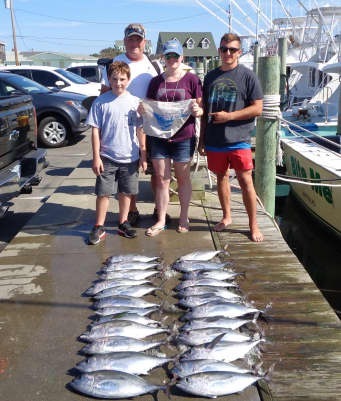 Cassandra Hershey of Chambersburg, PA: Blue Marlin release on Sea Creature. Jason Little of Mooresville, NC: Sailfish release on Sea Creature. 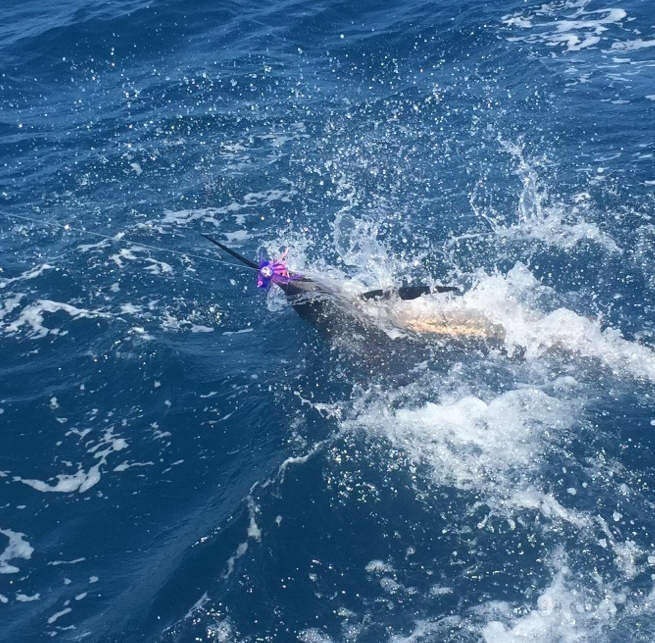 Danny Mattox of Statesville, NC: Blue Marlin release on Sea Creature. Another calm day with blue skies! 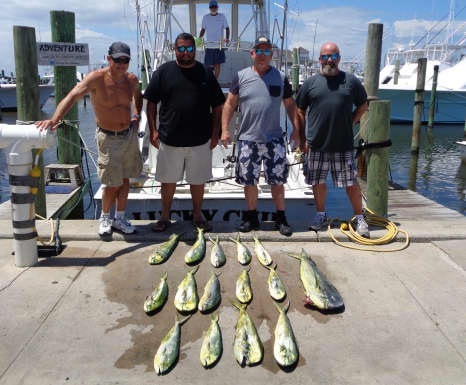 Fishing was good today with good to limits of Mahi, good Yellowfin Tuna and a few Grouper. Carolina Girl released a Sailfish. 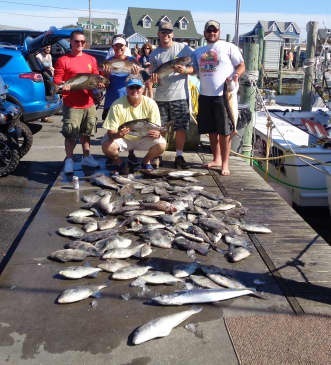 Inshore boats were catching Bluefish and releasing Red Drum. 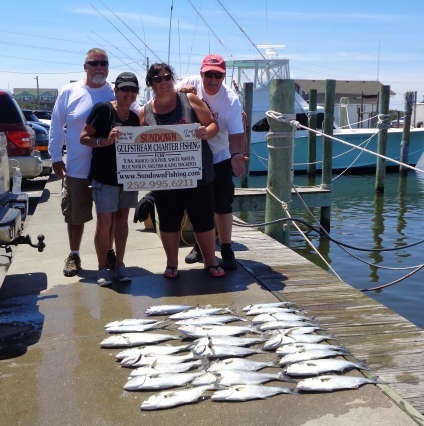 Nearshore boats were catching Bluefish and Amberjack. Sound Bound: Sheri Phillips of North Potomac, MD released a Red Drum. Good Times: Lee Ulrich of Mount Joy, PA caught a 41lb Grouper. 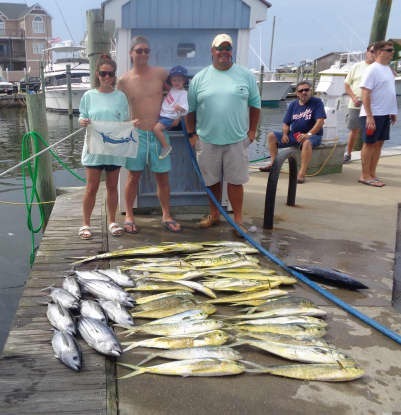 Carolina Girl: Zackary Oudersluys of Chesapeake, VA released a Sailfish and caught a 72lb Yellowfin Tuna.